change website address from MichaelMcCafferty.com to AirMikie.com (this will become the main website for the flying book(s), and from there it will offer a link to the blog, and to links at amazon.com and other sources to buy the book, download the Kindle/iPhone file, wall paper, screen saver, etc). 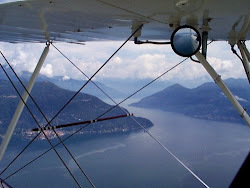 This is a book for pilots, adventurers, and dreamers, and especially for people want to live the life they've imagined. After 10 years of building my startup software company, I needed a rest, so I accepted an offer to buy my company, and started living my dream. 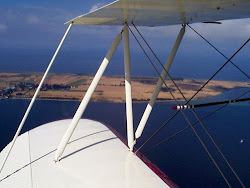 I bought an extraordinarily beautiful open-cockpit biplane, then learned how to fly, and for the next 7 years I lived the life of a winged nomad. 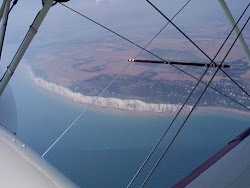 For three months during the summer of 1997, I "went flying", low and slow, exploring Europe's coastline, islands, Alps, big-cities and tiny villages. The non-stop discovery of foreign lands, culture, people, flying and adventure made it the greatest experience of my lifetime. Here is the true story, the complete collection of 94 emails, one per day, with photos, sent to friends back home.